Gum disease is one of the least noticeable yet most common oral conditions worldwide. Given gum disease’s potentially serious yet invisible signs, how can you protect yourself from losing your smile? Gum disease is no laughing matter. Millions of Americans are diagnosed with it each year and millions more remain untreated, leading to rapid decay and tooth loss. Additionally, gum disease has been linked with other serious health issues, including heart disease, diabetes, and other issues. For these reasons, we at Serene Oaks Dental fell it’s highly important to understand the invisible signs of gum disease to reduce your risk of developing serious health conditions, as well as the need for costly invasive dental treatments later on. This article will expose the top six signs of gum disease and what you can do to protect your healthy smile. These are some of the commonly overlooked signs of gum disease. Have you been ignoring them? In the initial stages of gum disease, called gingivitis, you may notice your gums becoming inflamed or reddish. This condition is typically solved with proper hygiene and a simple hygiene treatment with your dentist. If left untreated, gum disease may progress to the next stage, called periodontitis. Here is where you may begin to notice small amounts of blood in the sink when brushing or flossing. Other signs of this disease may include loose or sensitive teeth since the infection has likely spread and is now slowly harming the teeth and gum tissue. The good news is that there are practical treatment plans designed to save your smile and health if you do have gum disease. If you are experiencing the symptoms described above, contact our North Oaks dentist immediately by calling (651) 288-3111 or contact us online to address the problem before matters get worse. Did you know 80% of adults will have gum disease during their lifetime? Take this five-minute online quiz by Delta Dental to find out if you are at risk of developing gum disease. When it comes to your self-image and health, be proactive and prevent problems from developing in the first place. To protect yourself and your family from gum disease, proper hygiene, and regular dental checkups are necessary. Brush your teeth thoroughly twice a day. Schedule a dental exam and cleaning every six months. If you smoke, quit. Talk to your medical doctor for assistance to break this harmful habit. Gum disease’s invisible signs and multiple stages may build up secretly until a potentially severe condition develops! If you experience swollen or bleeding gums, loosening teeth, or receding gums, be sure to contact our North Oaks dentist as soon as possible. 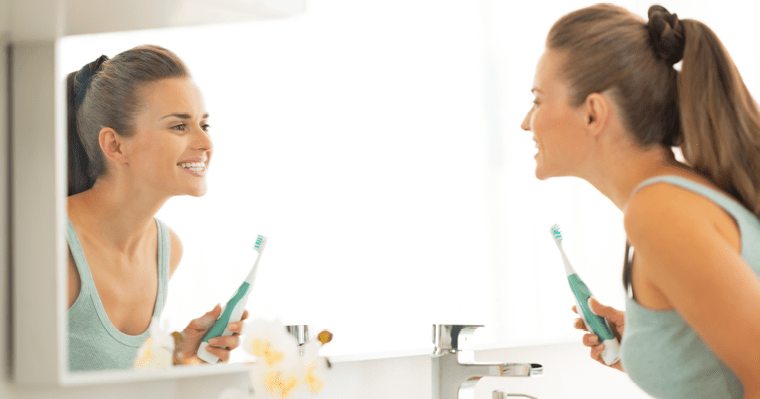 Maintain good hygiene at home and make it a priority to have regular dental visits. With planning and prevention, gum disease doesn’t have to rob you of your health and happiness!